Weeknights usually mean shortcuts. For example, glands I love meatballs but don’t have time to make them, search then brown them, erectile then let them simmer unless it’s a lazy Sunday. So, I look for shortcuts. A few years ago, I experimented with skipping the browning stage. Browning the meatballs gives them a more meaty flavor and allows them to keep their spherical shape. I found that if you cook the meatballs in one layer on the bottom of a large pot, you’ll still get a browning effect over time. I almost prefer this method because the marinara sauce also browns slightly, adding a more complex meaty and tomato-y flavor. As for them keeping their shape, they will as long as they’re stirred only once or twice. I also took some extra shortcuts like using store-bought marinara sauce. (Gasp! I know!) As long as it’s a good brand that uses no preservatives, you’ll be okay. I used Gia Russa brand, which is all natural and I’ve found to be consistently top-quality. To get some sausage-y flavor in there to compliment the Artichoke marinara, I used ground pork instead of ground beef and added some fennel seeds. The meatballs were tender and flavorful and the fennel seeds were there, but not overwhelming. 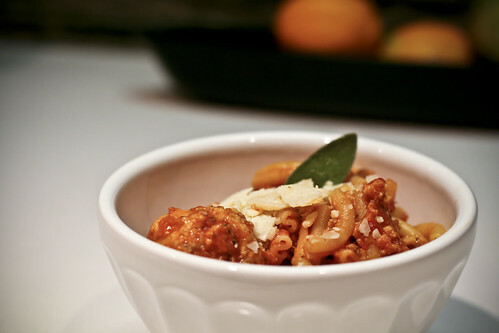 While weeknight meatballs still take quite some time to cook, it’s not active time. I made them in the morning while I was getting ready for work and only had to make some pasta when I got home. They were deliciously hearty and the leftovers made my co-workers jealous. Spread 1/3 of the jar of pasta into the bottom of a large, heavy-bottomed pot. In a large bowl, beat the eggs then mix in the breadcrumbs, Parmesan, milk, Worcestershire sauce, fennel seeds, salt and chile de arbol pepper until everything is combined. Add the ground pork and use your hands to combine everything. Once the egg mixture is evenly distributed, begin making the meatballs by forming balls that are 1 inch in diameter. Place the completed meatballs in the sauce as you go. Cover the meatballs with the remaining sauce and set it on the stove over low heat (2 or 3 on the dial) for 40 – 50 minutes. You can uncover the pot and stir occasionally so that the meatballs don’t stick, but be careful not to stir too much or they will fall apart. When the meatballs are half done, begin heating your pasta water. Once it’s boiling, salt it and add the pasta. When the pasta is almost al dente, turn the heat down to medium and reserve 1/2 cup of the starchy water and drain the rest. Pour the pasta back into the pot and cover with the meatballs, sauce and pasta water. Mix everything thoroughly over the heat source for about a minute and serve with freshly grated Parmesan cheese. *Chile de Arbol peppers are tiny, bright red, spicy and are the type of peppers used on festive wreaths in the southwestern United States. I used them dried and ground by way of a spice bottle in this recipe. MMMM! Your makin Nini hungry! Looks like someones been spending time in her new fab kitchen. And YES – Your co-workers were jealous. We always are…of your home cooked meals.